You might consider Green Juice with Fennel as a meal replacement drink for breakfast, lunch, or dinner on occasion or as often as you like. Its chocked full of nutrients that are easy to assimilate and this meal won’t slow you down or make you drowsy. Run ingredients through your juicer and enjoy! The greens in this juice are powerful healers and rebuilders. They’re loaded with minerals, phytonutrients, and if they are fresh enough life force. Always try to use the freshest produce available, and right from the garden if possible. Even if you don’t have a vegetable garden during the spring and fall there are probably loads of wild greens that can be added to juices for a really powerful nutritional boost. For more information on edible wild greens check out edible wild greens juice, mango and wild greens smoothie, and edible wild greens salad. The lemon actually helps the assimilation of the greens, and the apple adds a little sweetness, which buffers the taste of the greens a bit to make them more palatable. Juicing in general is a wonderful way to get clean easy to assimilate nutrients into your system in a hurry. 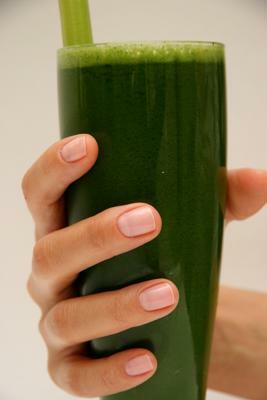 Green juices are much more balancing and effective healers than fruit juices. With the fiber gone, fruit juices provide too much fruit sugar to the system, which puts the body out of balance and can lead to health issues like diabetes. Green juices provide much needed minerals and chlorophyll, which help the body function at its optimum rate and keep things fresh and running smoothly. Chlorophyll cleanses the cells and tissues like a disinfectant making for a clean bio-terrain and fresh breath. In most instances its best to leave the peels/rinds on the produce because much of the nutrition is located there. This includes melons, lemons, and limes. The fruits that come to mind that you would peel for juicing, smoothies, or raw recipes in general are oranges, grapefruit, bananas, and avocado. I don't particularly like celery,so I used spinach instead. Yumm!! Just had a great juice lunch!